2007 Gulfi, Reseca, IGT Rosso, Sicily, Italy. Gulfi’s Mount Etna Rosso comes from a tiny parcel called Vigna Poggio, in Monte La Guardia, within the commune of Randazzo located on the northern slope of Etna, and it’s crafted from only Nerello Mascalese grown on ancient lava terraces surrounded by a chestnut forrest. The north slopes see a great swing in day time to night time temps and make for very delicate wines with good acidity and charm, it’s one of the reasons Mount Etna wines are often compared to Burgundy, and while Gulfi is better known for their southern zone Nero d’Avola(s) that are more rich and almost full bodied in style, but both are wonderfully graceful and balanced, leaning more on traditional rather than modern. 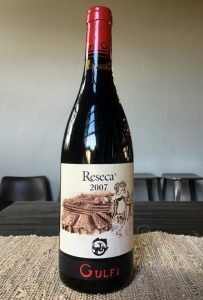 With the decade of age, the 2007 Reseca is remarkable fresh and vibrant in profile with silky tannins and wonderful depth and complex detail showing A range of spicy red fruits and surprising density. The mouthy feel is gorgeous, reminding you why they call Etna Nerello Mascalese the Burgundy of the Volcano with this Gulfi showing amazing touch with this grape, they farm to biodynamic principals and vinify with natural and traditional methods to highlight each wines terroir. Layers of red cherry, plum, raspberry and crisp red currant fruits form the core palate with dusty spices, anise, dried rose petals and a hint of earthy/leather. The wine is clean, lush and with excellent length, it’s flavors burst from the glass and it’s lovely ruby/garnet hue has no hint of age, this is elegant stuff, but with a sense of presence and substance in the bottle, certainly impressive and with plenty of years ahead of it. This Reseca, 100% Nerello Mascalese, got a long maceration on it’s skins and cool ferment in stainless vats then raised for almost a full 2 years in large French barrels (500L) making for a serious version of this varietal, allowing for potential 20 years of life or more here! 2016 Weingut Enderle & Moll, Pinot Noir “Liaison” Baden, Germany. Imported by and for von Boden, the lovely bright and light colored, the all biodynamic Liaison Enderle & Moll Pinot Noir from the Baden region is a vibrant tangy wine. Coming in at 12.5% natural alcohol, this lighter style Pinot impresses for it’s tart crisp character and juicy charms, it’s a fine country style wine that is at it’s best with a slight chill and with food, reminding me of a bit of Brouilly Cru Beaujolais with it’s dynamic acidity and fresh nature. Those that love Jura Trousseau or Poulsard will love this geeky little Pinot, those used to Burgundy or silky lush styles will find these a bit lifted or shocking to the palate with it’s racy red fruits and it’s tart personality. The dominant force here is unripe cherries and wild plum fruits and a bit of herbal strawberry character along with brisk minerality, and absolutely no wood influence present. Sven Enderle and Florian Moll work with very old vines, in fact their vines are among the oldest Pinot Noir vines in Baden, with this Liaison coming from 45 old vines. They go against modern thought and go for a strikingly fresh style and use old wood, interesting they get 5 year old Domaine Dujac barrels. This dynamic Germany Pinot is a fun contrast to the more serious (richer/riper) versions of spatburgunder like those of Frederick Becker in the Pfalz and or Meyer-Nakel in the Ahr which are much more impressive in structure and depth. You can see this wine getting a cult Somm following in the USA if it doesn’t already, already quite famous in Europe, and while I admire it and enjoyed this Enderle and Moll Liaison Pinot Noir as an intellectual experience, I wouldn’t except it to be a real impressive crowd pleaser. This tight and lean profile lends itself to a slight refreshing chill and certainly would be better with food to show it’s best, it’s a wine for the weirdly curious and should be enjoyed young, drink over the next 2 to 3 years. 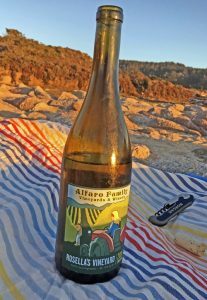 2016 Alfaro Family Vineyards, Chardonnay, Rosella’s Vineyard, Santa Lucia Highlands. The beautiful pale gold and straw colored Rosella’s Chard by Richard Alfaro is a richly flavored and textural white that delivers a classic Santa Lucia Highlands performance and profile, similar in vein to Jeff Pisoni’s Lucia Vineyards, Morgan’s and Roar’s own Rosella’s. Only 200 cases were made of this Alfaro Family Rosella’s Chardonnay coming of the estate of Gary Francsioni in the cooler end of the Highlands from a mix of clones, mostly Dijon set on the sandy loam(s) that gets a cool breeze and marine influence that allows a long growing season and deep flavor development. Richard Alfaro, a winemaker with a great gift with Chardonnay, both as a winemaker and as a grower, raised his Rosella’s for 9 months in French oak barriques of which 40% were new, the barrel tones are perfectly matched to the ripe fruit and vibrant acidity, making for a full bodied Chardonnay, but one with a balanced form and lovely elegance. This Chard can be enjoyed with cuisine, especially with a variety of sea foods, while bold and lush it’s keeps it’s vitality and charm throughout, and it drinks great all it’s own and with popcorn while watching a movie or a sunset at the beach. The palate is filled with complexity, but pleases with a smooth sense of stylish seamlessness, it flows with baked apple, golden fig, a touch of tropical fruit along with lemon curd, vanilla and a hint of butterscotch, adding delicate lime blossom, wet stone, saline and yellow peach notes. This is an under the radar addition to Alfaro’s lineup from a Cru site, and a plush counterpoint to his other offerings, like his mineral driven Trout Gulch and gorgeous Estate Lindsay Paige, as well as his exotic (Kongsgaard Clone) Mary Katherine Chardonnay, all of which are serious wines that are also insanely great values! Richard farms and crafts some of the best California Chardonnay, especially for the price, and if you’ve not tried them, then you are missing out, these are beauties, plus he does a set of Pinots, both from his own estate vineyards in the Santa Cruz Mountains as well as like this Rosella’s Chard, from select sites, including Garys’ and Rosella’s. His winery in Corralitos is a must visit when you are in the region, other than the mentioned Pinot Noir and Chardonnay, Alfaro also makes Gruner Veltliner, a fun Rosé of Pinot Noir, a Sparkling Brut and a very limited estate Syrah that are certainly worth checking out. The 2016 Rosella’s Chard shows a ready to drink and overt personality that is hard to resist, it should age nicely for 3 to 5 years, but I adore it’s youthful fresh underpinning and would not wait. 2017 Morgan, Rosé of Grenache, Arroyo Seco, Monterey County. 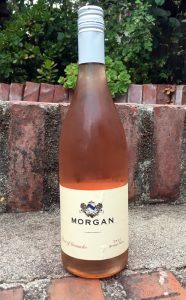 Morgan Winery, a Monterey classic, best known for their Pinot Noir and Chardonnay offerings also does a studied selection of Rhone wines, these include two wonderful Syrah(s) and a Cotes du Rhone blend, as well as this French style dry Rosé of Grenache. There’s a lot of excitement at Morgan these days and a new vigor in their step, with their Sam Smith, winemaker, crafting some amazing wines from Dan Lee’s Double L Vineyard and other top sites in mostly the Santa Lucia Highlands. The Rosé is made from 100% Grenache, it was direct press and picked to be dry Rosé, making for a vibrant and crisp pink with stony detail and pure Grenache juicy flavors. The hue is lightly pink and pale with a touch of orange on the edges from the short maceration and the palate is vivid and bright with watermelon, wet rock, citrus, rosewater, a touch of raspberry and sour cherry. This brisk Rosé is wildly refreshing and easy to love, great on it’s own as well as a nice companion to Summer fare, it pairs great with seasonal salads and is especially brilliant with sand under your feet watching a warm sunset. These 2017 vintage Morgan’s are looking like a great collection of wines, if you’ve not had this winery in a while it’s a really good time to check them out again. 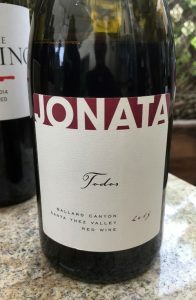 2013 Jonata, Red Blend “Todos” Ballard Canyon, Santa Ynez Valley. 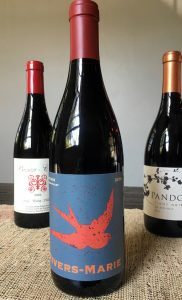 The Jonata Todos, made by the very highly regarded Matt Dees, one of California’s great new generation winemakers, is a fascinating red blend from tiny yields on their estate vineyards, set on the Jonata, where the winery gets it’s name, sandy soils. The few years of bottle aging has helped allow this intriguing wine open more fully and expand it’s complexity, the blend is really unique being a mixed of about 56% Syrah, 14% Cabernet Franc, 10% Petit Verdot, 10% Sangiovese, 7% Petite Sirah, 2% Cabernet Sauvignon, 1% Viognier! The grapes were farmed to perfection by Ruben Solorzano, the hugely talented vineyard manager, who is the vineyard manager at Stolpman Vineyards, it is amazing how much fruit they dropped to achieve the results in the bottle, from what I understand the yields were just 25% of the normal size, which certainly shows it in the intensity and depth of flavors in this wine. Dees and his team got loads of concentration in this 2013 Jonata Todos with a deep sense of the Syrah leading the way, with a nod to a Cornas, the amount of whole cluster adds to that palate impact and impression with plush blue and black fruits and heightened savory notes and nervy energy. The chewy mouth is filled with layers of boysenberry, black raspberry, plum and dark sweet cherry fruits along with dried lavender, mixed pepper with cracked black and red flakes, anise, light cedar notes, cinnamon and lingering cassis. With air you get even more with earth, stones and leather coming through, with the other varietals having more of a say in this very purple/garnet red, as well as some subtle oak framing, and while a touch rustic this wine is forward and California plush and wonderfully expressive from start to finish, Dees deserves a ton of credit for the quality here, and be sure to check out some his other projects like is amazing Pinot(s) he does under the Mail Road and especially his Hilt from awesome plots in Sta. Rita Hills including Radian and Bentrock! Dees, with a degree in Soil Science from the University of Vermont, has done vintages at Staglin in Napa and Craggy Range in Hawkes Bay, New Zealand, is a believer in holistic vineyard practices and wants to transmit the terroir into the wine, this is a worthy work in progress and the wines are excellent, in particular this Todos, a modern field style blend, it’s a wine that should age well and be rewarding with robust cuisine. 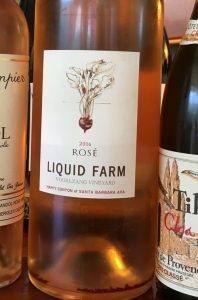 2016 Liquid Farm, Rosé of Mourvèdre, Vogelzang Vineyard, Happy Canyon, Santa Barbara County. Liquid Farm, known mostly for their amazing Chardonnay program, including their awesome Sta. Rita Hills Golden Slope Chardonnay, also do one of the state’s most prized pink wines, in fact it’s called “Pink Crack” by those in the know, looked to the region of Bandol in Provence for the inspiration behind this Rosé. according to winery notes It is a combination of 95% Mourvédre and 5% Grenache sourced from Happy Canyon (a Santa Barbara AVA). The grapes are pressed as soon as they arrive to the winery, cool and fresh, picked a touch early to keep low sugars and is barrel-fermented in neutral (French) oak, bottled after just 5 months of aging. The Liquid Farm Rosé of Mourvèdre, along with Bedrock’s Ode to Lulu, is often called the Domaine Tempier of California, which is high praise and it usually lives up to the hype, especially in vintages like this 2016, which I tasted from Magnum! The delicate salmon pink hue is subtle and sublime in the glass, with the extra year of age it seems a bit sleepy at first, but gathers itself up and gives a rich and vibrant performance, though I bet the 2017 will be a touch better at the moment, still this is seriously good stuff with a more mature Mourvedre feel and slight earthy intensity that is not unwelcome. The palate is maybe less racy that the newer vintage, but has a crisp sense of detail with tart baked cherry, distilled strawberry, a touch of leather, wild lavender, loam and a hint of watermelon. It has a core of fruit and the usually mineral freshness has become more hidden, best to enjoy these Liquid Farm pinks young, which is unbelievably easy anyway! 2016 Drew, Pinot Noir, Fashauer Vineyard, Anderson Valley. One of the fuller and riper Drew Pinots, but not heavy, the Fashauer Vineyards bottling comes from a 16 year old site along the Greenwood Ridge at about 1350 feet of elevation set on Franciscan Series and Oceanic Sedimentary soils, with lots of mineral content. Just within the Anderson Valley AVA, even though with it’s proximity to the Ocean and height it could also qualify as Mendocino Ridge. Drew used all native yeast, on this Fashauer, and went with just 10% whole cluster on the grapes, from clones 115 and 667, which were farmed, according to the winery, mostly to organic practices, and it was raised in about 30% new French oak. With only 2 tons per acre, there is some concentration and depth of flavors in this Fashauer, it comes in at 13.8% natural alcohol, making it one of the more flashy and fleshy wines of the Drew lineup, but it is still remarkably nimble and fresh. 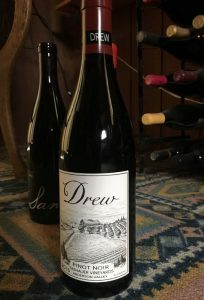 This vintage shows lots of vibrancy with wonderful precision and focus, it’s another Pinot that highlights Jason Drew’s exceptional talent, as well as a reminder that Drew is one of the best wineries in California, period. Bright and racy red fruits lead the way, with red currants, plum and cherry fruits jumping from the glass along with a streak of distinct strawberry and youthful acidity that allows this wine to feel lighter than it is, there’s also snappy spices, mineral notes, faint earthy elements and delicate florals, plus a kiss of sweet French oak. Honestly, this is presenting itself as open and forward, but I believe as good as it is now, it will fill out further and develop more exciting complexity in the next 2 to 3 years. This Pinot has a refined quality, it’s lovely ruby/garnet hue inviting and it’s personality leans toward the Cote de Beaune, at the risk of sounding cliche, but there is a beautiful textural presence and the red fruit core is hard to resist, drink from 2019 to 2027. Drew’s lineup is full of greatness, so expectations get really high, especially with his estate grown stuff, I might not be giving this one it’s due, more credit to Jason Drew on making such an amazing set of Syrah and Pinot(s), I can’t wait to revisit this one after some more cellar time. 2014 Weingut Von Schubert Maximin Grunhauser, Riesling Sekt Brut, Mosel, Germany. In recent years German Sekt has become some of the top bubbly you can buy, often rivaling elite Champagne for class, depth and beauty in the glass, and this Maximin Grunhaus Riesling sparkling wine certainly does, it’s an elegant and decedent example that delivers a very fine performance. The Maximin Grünhaus estate lies at the foot of a long steep south-facing slope on the left bank of the Ruwer river, about two kilometers before it joins the Mosel. The estate belongs to the Von Schubert family, who have turned this winery into one of the best in Germany and the wines here are world class, renown around the globe. The blue Devonian slate soils and steep hillsides give these wines their mineral charms, intensity and long-lived structures with the cellar employing modern techniques and ultra clean winemaking to achieve exacting terroir character and purity. The Sparkling Riesling is a dry Brut style with lovely perfume, lively fine mousse and beautiful details with searing green apple, citrus and hints of orchard fruits, hazelnut and steely vitality, this is so good, classy and lengthy. The dedication to quality runs deep here at Maximin Grunhaus, and the winery adds that depending on the requirements of the harvest, the grapes can be macerated or subjected to whole bunch pressing in a modern pneumatic press. After natural clarifying overnight via sedimentation, the musts are brought to an optimal fermentation temperature, and fermented with naturally occurring wild yeasts in classic large oak casks (Fuder casks) or small stainless steel tanks. 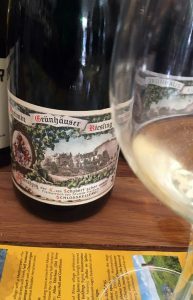 This according to the Von Schubert’s, promotes the optimal development of mineral flavors from the slate soil and ensures the longevity of the Rieslings. Neither the must nor the finished wine are fined. In the last two years the wood for the barrels has come from the estate’s own forests, and the barrels are crafted by a local cooper. I could drink this stuff all the time, dry Riesling bubbles always seems right, I’m a fan of quite a few German sparklers, including Von Winning’s, Leitz’s, Kruger-Rumpf’s and maybe the best sparkling wine I’ve ever had, Caroline Diel’s Cuvee Mo, eight year yeast (lees) aged Brut, which is so amazing it can go head to head with vintage Krug! These are great sparkling wines, and this Maximin Grunhaus Sekt is very worthy, you should really check it out, along with their dry GG Rieslings of course! 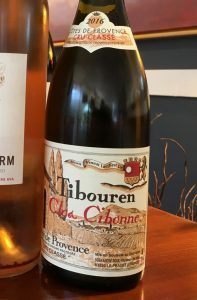 2016 Clos Cibonne, Tibouren, Cotes de Provence Rosé, Cru Classe, Cuvee Tradition, Provence, France. One of the great wines of the world, the Clos Cibonne Rosé is crafted to age and made from the rare and ancient Tibouren grape that once was more widely planted in Provence, before Mourvedre and Grenache moved into the area in the late 1,800’s. In fact the Roux family even ripped out Mourvedre to make room for more Tibouren in the 1930’s and gained the rare Cru Classe states for his heroic efforts with this grape and wines. The vinification is ultra traditional and old school, with what I believe is direct pressing and a short soak on the naturally light pigmented skins, with the winery adding that after fermentation the wine is aged on the lees under fleurette for 1 year in 100-year-old foudres (large French oak oval casks) that allows for the wines complex details, stability, textural qualities and age worthiness. The 2016 Cuvee Tradition, from 30 plus year old vines set of rocky schist, is all organic and was made up of 90% Tibouren and 10% Grenache, which adds a touch of color and juicy fruit, grown on the estate’s 15 hectares of vineyards that are located, as the winery notes, a mere 800 meters from the coast and are surrounded by hillsides in the base of a bowl that faces the sea. Explaining the terroir elements, the winery infers, that this topography creates air circulation that allows for perfect maturation of the grapes and helps to reduce any vintage variations, providing healthy ripe and balanced fruit year to year. The other Tibouren by Clos Cibonne the Cuvée Spéciale des Vignettes that is sourced only from the estate’s oldest vines, and was reviewed prior is one of my all time favorites, but this is classic stuff too and I love this 2016 vintage, it’s intriguing and pure. I wish I had sampled this one before tasting the Cuvée Spéciale des Vignettes, because it is just not quite as thrilling or impressive, even though it’s a great wine on it’s own! The palate is full and round with layers of earth red fruits, citrus and cool mineral charms, adding an intriguing slightly oxidative tone, even though full of life and acidity, it shows poached cherry, strawberry, orange zest and wet stone as well as a hint of dried herb, almond oil, earthy/leaf and a faint hind of rosewater. With a cult like following, Clos Cibonne is never easy to find, but is a steal for the style and class in the bottle, drink these 2016 up over the next 2 to 3 years. 2016 Rivers-Marie, Pinot Noir, Anderson Valley. Made by one of California’s most celebrated winemakers, Thomas Rivers Brown, who has made Schrader, Maybach Cellars, Outpost, Round Pond, ALOFT, and Kinsella, along with Turley, as well as many other luxury Napa Valley Cabernet(s), past and present, that have graced many covers of Wine Spectator, the Rivers-Marie is his own label. His celebrity status ensures a long waiting list of which makes for a hard get, and since his own wines are wonderfully affordable, especially in comparison to the elite brands he makes, even though they are extremely limited offerings. 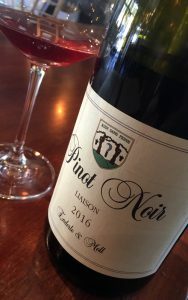 I got lucky and was able the grab a bottle of his 2016 Anderson Valley Pinot Noir from a friend on the mailing list, for which I’m forever grateful! Rivers-Marie, owned by Thomas Rivers Brown & Genevieve Marie Welsh, has a set of Cabernet Sauvignon, Chardonnay and Pinot Noir, and this one is a regional cuvee from the Anderson Valley, their first from this area, it has zero percent new oak, which, according to Brown, allows all the best attributes of the grape and the vintage to shine through, I tend to agree. Rivers-Marie also released a single vineyard Anderson Valley Pinot from the new hot spot Bearwallow Vineyard as well, it comes off younger vines and is slightly riper, while the Anderson Valley cuvee comes in at Burgundy like 13.8% natural alcohol and has a gripping presence in the glass. The nose here is serious, making one think of Anne Gros Richebourg with hints of bacon fat, dark fruits, mineral and spices that takes some time to open up to prettier tones with florals, the color is a deep garnet, which intrigues and leads to the firm and youthful palate. The Rivers-Marie Anderson Valley Pinot Noir is chewy and deeply flavored and has layers of black cherry, vine picked berries, plum and punchy currants, with an earthy fruit core as well as lifted spices, light oak notes and shows a nice cut of acidity, it’s a medium bodied Pinot that has should have a few more years in the cellar to fully develop, but that potential is clearly on display, adding depth and complexity with every minute of air it gets. A contrast of savory and stony notes expands the width here with flinty notes, wild mushrooms, black tea play opposing roles to the wilted rose, sweet tannin and the underlying opulence, there is a lot to admire here, though a more rewarding wine is certainly on the cards, patience should be the virtue you celebrate on this one, give this a 3 to 5 year rest if you can keep your hands off it, clearly I couldn’t, and I paid the price.